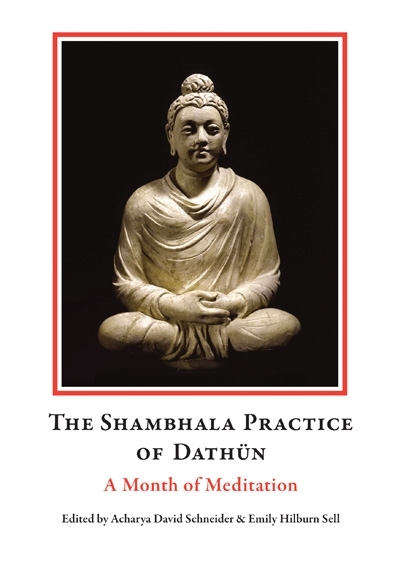 Dathun––literally, "moon session"––is a foundational practice of the Shambhala community, where it plays a crucial role on the student's path. For an entire month, participants in a dathun sit together in meditation––with breaks––from early morning until evening. This book contains teachings on the practice of dathun by Chogyam Trungpa Rinpoche––who introduced the practice in the early 1970's––and by the current leader of Shambhala, Sakyong Mipham Rinpoche. As well, it includes articles by Ani Pema Chodron, Acharya Jeremy Hayward, Acharya Dorje Loppon Lodro Dorje, and other senior students involved in the creation of this unique form. These explore features of dathun life, including the practice of mindful eating and the daily acceptance of precepts. . . . For those who are now at a dathun, for those who have completed a dathun, and also for anyone who would like to consider engaging in this life-changing practice. Softcover 5 7/8 X 8 1/4"